Finished and assembled the head board. Again this section was even tougher to scribe due to the top rail being curved and twisted, turned out pretty good. Next step is to clean them up to get them ready for staining, haven’t quite decided on stain color yet. Birch stays a whitish color, even when polyed. 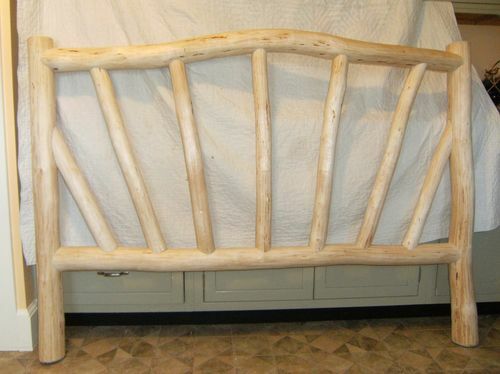 I want this bed frame to look rustic aged. Side rails will just be 2x stock and joined with heavy duty bed rail fasteners. That looks great. Those scribed joints look amazingly tight. Nice job. It does look great. What is a scribed joint…a tenon with crooked wood? So are you doing the rustic cat tree or the carpeted type? The joints are drilled and doweled, scribing each piece together to make them look like one piece. Basicly using a compass to scribe or follow the contour of each log to fit together, its not an fast process. Cat trees, yes they will be rustic using extra logs, I will also scribe these to make them look like a tree (I got the idea from the client I sold most of the logs to) I will use sisle rope instead of carpet. 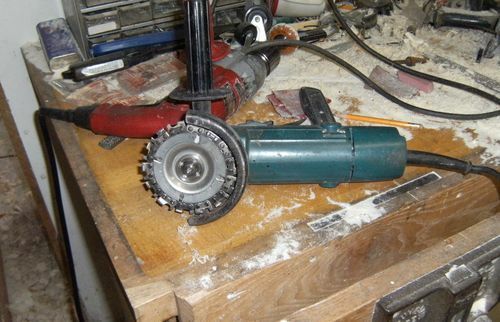 I left out that in the last post I described that I roughed out the scribes with a Jig saw. Well I was thinking there had to be a quicker way and I remembered that I had a chain saw attachment for the grinder, yup much quicker!! Also want to add this link to when I first harvested the logs, It was posted in the lumber forum instead of this blog. Your work is exceptionally neat! What are you using for dowels? First let me mention that this is a Queen size bed frame, not sure if I’ve noted that. The Posts & Rails are 3 1/2 – 4” Yellow Birch and I used 1 1/2” wooden dowels. The slates are 2-3” Y Birch and I used 3/4” dowels. their metric sized, had to shape them to size. All assembly is with Glue only, no screws or nails. I have made some things with logs and used a tenon cutter. That does leave the tenons visible, of course. And I don’t mind that look, but yours looks so precise. It must take a heck of a lot of time. I also like the idea it’s glue only. I work like that too!